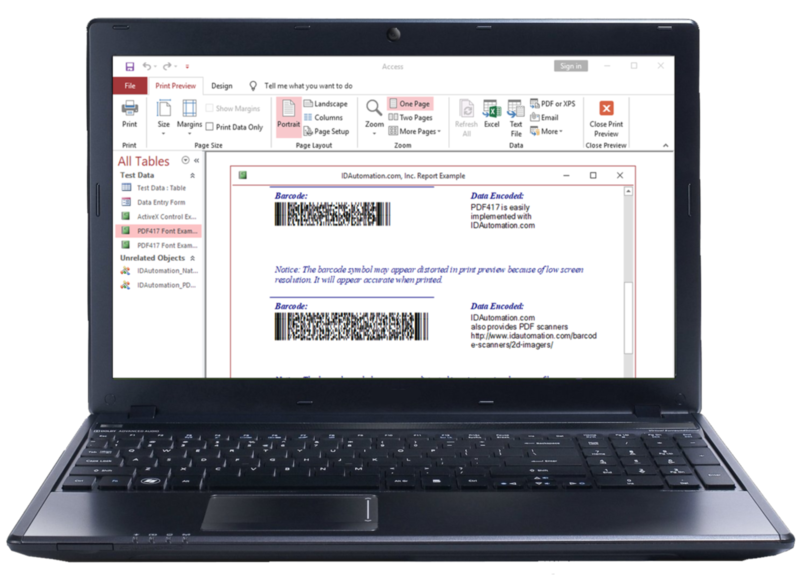 Creating barcodes in Microsoft® Access™ can be a relatively easy task with IDAutomation products. IDAutomation has easy-to-use barcode plug-ins, macros and barcode fonts. The information provided here was created with the assumption that the user has a basic understanding of barcoding, otherwise please review IDAutomation’s Barcoding for Beginners. When implementing barcodes in an Access database, the ActiveX Controls are an easy-to-use Microsoft plug-in. However, if using barcode fonts instead, these require adding the start and stop character and calculating the check character if needed manually or using IDAutomation Office VBA Macros. If there is a need to create barcode labels out of an Access database, the Barcode Label Software application can link to Microsoft Access columns as a data source for a text or barcode object, which allows printing of labels from data in Access. The Native Barcode Generator for Microsoft Access provides dynamic barcoding capability to Microsoft Access Reports without the installation of additional fonts or other components. Once installed, the product remains embedded in the database, even when distributed. Complete VBA source code is provided with purchase. Supported symbologies include Code 3 of 9, Code 128, MSI, UCC/EAN-128, Interleaved 2 of 5, PostNet, OneCode and PDF417. After purchasing or downloading the plug-in, which is called the ActiveX Control, it can be dragged, dropped and resized it on a form such as a report. To bind the control to a data source, enter the table and field or formula in the control source field; do not just enter the field. In Design Mode of a Microsoft Access report, choose Insert – ActiveX control. Select the installed control starting with “IDAutomation”, drop it on the form and resize the control as necessary. To change the properties of the control, such as barcode height and symbology type, right click on the control and choose properties. The proper barcode will show up after the report is saved and run. The barcode will be created from the data in the control source field. Implementing barcode solutions with IDAutomation fonts provides a high level of scalability with operating systems, applications and printer independence. It should be noted that if the client is not a technical user or programmer, use the self-checking barcode fonts. Self-checking fonts (such as Code 39 and Codabar) have the checking code built-in so that it is not necessary to calculate check characters. Self-checking fonts are easy to use in Access as well as other applications and can be entered directly from the keyboard. All barcodes require start and stop characters and must be included in the barcode. Without the start and stop character in the barcode, the scanner does not know where the barcode starts or ends. 1. Select the font from the list of fonts in the application. 2. Type the start character, in this case it is “!” . 3. Type the data, in this case it is “1234ABCD” . 4. Type the stop character, in this case it is “!”; the data string at this point should be !1234ABCD! Then change the font back to the default font of the document so other text typed in will be human readable. Below is an example of placing the above formula in a text field on a report in Microsoft® Access 2000. When placing formulas in the control source field, be sure to specify the table and field together as in this example. Barcode symbologies such as Code 128 or UPC/EAN, require special formatting so that the data, when the barcode font is applied, will be scannable. To use fonts other than the self-checking versions, please refer to IDAutomation’s Microsoft Office Macros site. Over 30 royalty free font encoders, macros and plug-ins are provided to complete this automatically.